Is It Safe to Call Romo a Leader Now? With the news that Tony Romo is organizing and running the offseason practices during the lockout there is suddenly renewed talk about Romo's lack of leadership. I would have thought that the 2009 season which resulted in the first Dallas playoff victory in 13 years would have ended all of this leadership talk. I thought watching the team completely implode for a few weeks after he went down with his broken collarbone last season might prove how much his teammates depend and believe in him. It seems as if the leadership questioners will only be satisfied if Romo "leads" the Cowboys to a Super Bowl win and yells at his teammates on the sidelines every step of the way. 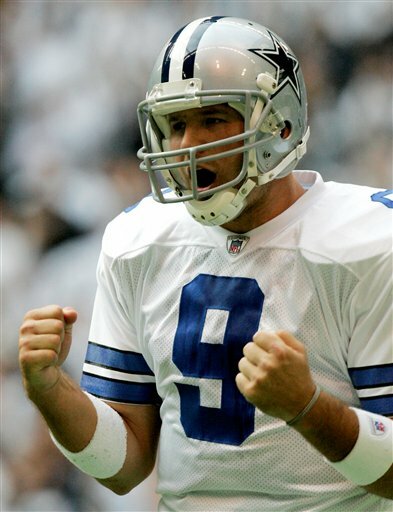 I have always hated the ridiculous notion that Tony Romo isn't a leader. There is a perception in many circles that the Romo doesn't inspire his teammates to excel. I completely disagree with that notion. I would love for some of those people to go back and watch Joe Montana play in his prime. Was he a leader? Do you see him constantly screaming on the sidelines? Is it possible that maybe there is more than one way to act as a team leader? Ever since Romo went down with his broken collarbone there has been talk that Jon Kitna sparked the Cowboys 5-3 finish in the second half of the season. According to those people Kitna somehow inspired his teammates to play better. Of course those same people leave out the fact that in the first two games he started the Cowboys lost 35-17 to the lowly Jaguars and 45-7 to the Packers in the most embarrassing loss in Cowboys history. And, amazingly, he supposedly managed to improve not only the offense, but also the defense a special teams while filling in for Tony Romo. It is hard for me to understand how Kitna changed the entire offensive game plan and the defensive philiosophy because he is such a great leader. Maybe the coaches just changed things up when Wade Phillips was fired because they realized that the team was going down in flames. The offense recommitted to the running game. The defense stopped blitzing and playing man coverage on every single snap. Could it really be that simple? Maybe Jon Kitna isn't some sort of magician after all. I don't want to sound like I'm slamming Kitna. He is an excellent back up quarterback. But he is a back up for a reason. He is a solid pro. But he has zero playoff wins in 14 years. He doesn't have the arm to scare the defense. And he can't make all the throws that Romo can make. So people hang their hat on this mystical leadership quality. Again, I'm not trying to bad mouth Kitna here. But he has even led a team to the playoffs in all his years in the league. In fact, he has 50 wins and 74 losses in his career as a starting QB. I realize that he played on some bad teams but if he really possessed these magical leadership qualities that so many want to talk about don't you think he would have willed at least one team in 14 years to a playoff appearance? So now Romo is organizing team practices during the lockout to insure that the Dallas Cowboys turn things around next season. He is running the practices and acting as the coach of the offense while some of the other veterans are running the defense. And Romo is the guy making sure that 40+ people show up at an undisclosed location and get to work. So Romo is, in essence, the head coach of the workouts. So does that prove he is a leader? Maybe this will finally convince some of the doubters that Romo has turned the corner on the mystical leadership front. But I have been convinced for a long time that Romo not only possesses enough talent to lead the Cowboys to the Super Bowl but he also has the competitive desire and personality that his teammates will follow. I know those that want to constantly bash Romo won't be convinced by my arguments but I think both sides need to be heard on the topic. Thanks to the NFL lockout reversing the typical chain of events for the offseason the Cowboys had to scramble like every other team to develop a new plan. Now that the draft has been completed it has left some very apparent roster needs for the Cowboys whenever free agency finally does get under way. The drafting of Tyron Smith seems to indicate that Marc Colombo may be done in Dallas. I have serious doubts that the Cowboys have any desire to keep Colombo around after picking a tackle with the #9 pick in the draft. You don't pick a top ten player to sit him on the bench. And I don't see Colombo being ok with restructuring his contract and riding the pine next year. The DeMarco Murray signing probably signals the end of Marion Barber's career in Dallas. The Cowboys need three running backs and they currently have four on the roster. It would be hard to imagine Barber coming back for another year with his bloated contract and deteriorating skills. Safety will be the #1 priority in free agency. Gerald Sensabaugh will be a free agent and the Cowboys have made it clear that they intend to move Alan Ball back to cornerback this year. I don't think Barry Church is ready to step into a starting role and there really isn't anyone else on the roster who could even be considered a potential starter next year. So the Cowboys will likely re-sign Sensabaugh and then target one of the top free agent safeties. With the money they'll free up by cutting Barber, Colombo and maybe a few other veterans they should have the money to go after a top tier safety. Defensive end is the #2 priority in free agency. I didn't name this the #1 priority only because I believe the Cowboys plan to re-sign Jason Hatcher and Stephen Bowen. And if Marcus Spears tests the market in free agency he might find that Dallas might not be so bad after all. I think the Cowboys will bring back Hatcher and Bowen but hopefully they have a plan B in place in case they can't bring both guys back. By failing to draft a defensive end the Cowboys have back themselves into a corner at this position. Sam Hurd has probably played his last down in Dallas. He was going to test the free agent market anyway, but now the Cowboys really have no reason to pursue him since they drafted Dwayne Harris out of East Carolina. He has return skills that will make him a valuable game day asset. So the wide receiver corp will probably be Miles Austin, Dez Bryant, Roy Williams, Kevin Ogletree and Dwayne Harris on game days. Hopefully the ruling will come down this week that forces the NFL to get the league year started so the Cowboys can fill their roster holes. I think they did a solid job with the draft, but we won't know for a few years if it was good or bad. But at least they addressed the offensive line and did enough that it isn't inconceivable that they can address enough of their needs in free agency to be a contender in 2011.